Don�t Allow Big Oil and Gas to Block Environmental Investigations ! PLEASE SIGN ! ! Don't Allow Big Oil and Gas to Block Environmental Investigations ! PLEASE SIGN ! ! Over the past year, the Environmental Protection Agency has repeatedly shut down its own fracking-related environmental contamination investigations after being pressured by the oil and gas industry. 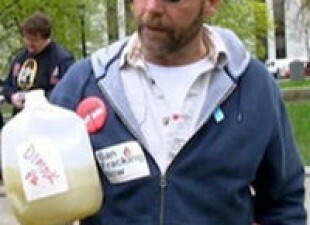 "Tell the EPA to Investigate Fracking Contamination!" & Noted & Thank you Cher. page was scrambled and no where to sign. I was able to open petition on standing up for bears so I signed that. A petition against fracking popped up for me here, so I signed that one. Big Oil can claim whatever they want--fracking is death on the environment and, ultimately, us. I look to the day when some genius discovers a green alternative and the biggies have to stop. Every dog has its day. The oil and gas companies are called Big for a reason, and they have only one goal. It's not to supply energy, either--it's to become bigger (along with their bank accounts)! The black tar-filled tide will turn, and hopefully before it's too late. If I sound overly negative, it's because I've seen the power these overly large companies have in politics, an arena in which they have no place whatsoever. The solution is simple, of course--ban them! Previously signed. Thanks for posting this, Cher. Frack this! Stop destroying our home. It's ridiculous how greed turns people against all reason and common sense.